No need to tell Pittsburgh Steelers president Art Rooney II about the difficulties of finding transcendent talents. He has seen three absurdly good players — linebacker Ryan Shazier, wide receiver Antonio Brown and running back Le’Veon Bell — lead his team to victories only to leave the lineup, potentially for good. Loose translation: All-Pros are really hard to find, no matter how difficult. That’s why any exchange for Brown must produce serious draft capital. And the Steelers are hemorrhaging top talent. As a result, this offseason is shaping up to be a test of mettle for an organization that must strengthen the roster on the fly. The loss of Shazier to a severe spinal injury in late 2017, coupled with Bell’s yearlong holdout and the seemingly inevitable trade of Brown, are nearly impossible to replace on the surface. Shazier wants to continue rehabbing for a return to football, and the Steelers plan to help him with that, but he’s not in the plans for the 2019 roster. With a little creativity, they can be right back in contention. They have $27.72 million in salary-cap space, according to OverTheCap.com. They can create more with roster cuts and restructuring the final year on Roethlisberger’s deal. Rooney said the Steelers feel good about their running-back lineup with “two good, young players” in James Conner and Jaylen Samuels. The Steelers haven’t made a firm decision on whether to place the franchise tag on Bell for a third consecutive year, but Conner made a Pro Bowl in his first season as a starter and Samuels is a natural pass-catcher. 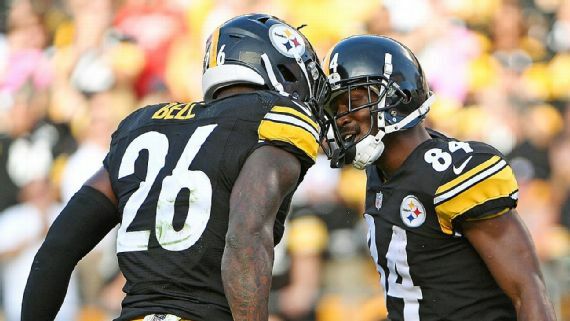 They can roll with those two players if Bell’s situation has become too explosive.